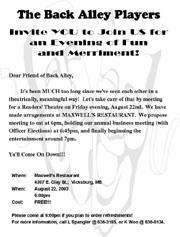 This is a website with information about the Back Alley Players of Vicksburg, Mississippi. This site is a work in progress. Check back for more information as we develop. You're out on the dance floor shaking' your groove thang and showing off some of your best moves. Suddenly, there's a scream! Someone has just been killed! Who did it -- and why? Can you solve this crime? Do you know who did the foul deed? Join us for an evening of murder and mayhem! Come dressed in your best 70's duds -- get those bell bottoms and tie-dye's out of the attic, and that polyester suit out of mothballs! Friday, October 29th and Friday, November 5th, 2004 at 7:30 p.m. It's 7:00 pm in the River City. You're listening to W-B-A-P, broadcasting at a power of 25 microwatts and a frequency of 6180 kilohertz. Our broadcast tower is located at 175 Washington Street, with studios located at Borrello's Restaurant, 1306 Washington Street in downtown Vicksburg. 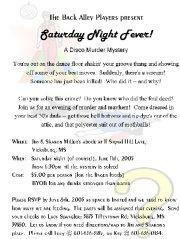 Click here to view the flyer... if you dare. Click the picture above to view more pictures, or click here to view the cast list. 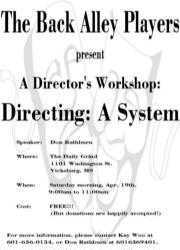 Saturday, April 19th, 2003 from 9:00 a.m. to 11:00 a.m.
Free, but donations happily accepted. Radio Station WBAP was on the air at 7:00 pm on Friday, 25 October and Friday 1 November 2002 for Halloween Hauntings! Click here to view the flyer and here to view pictures from the 25 October broadcast at The Biscuit Company, 1100 Washington Street... if you dare! Readers' Theatre at The Ground Floor on Sunday, September 15th, 2002. Click here to view the flyer, or here for pictures. Click here to go the Radio Station WBAP page. 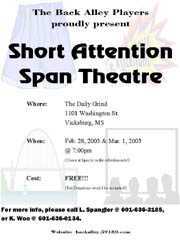 This is an old-time radio show, presented by the Back Alley Players at The Ground Floor on Washington Street on 26 April and 3 May 2002 at 7:30 pm. Click here for pictures from the 26 April show, and here for pictures taken 3 May.